Review | Volvo has given us a choice. Beside from the entirely new V70, there is the XC70, which is just as refreshing. Both cars have the same engines; equal amounts of space; comparable kit; and the same security levels. However, the XC70 has that little bit more: with its four-wheel drive and heightened suspension, the XC70 goes where the road no longer does. It didn't have to but it just couldn't resist it during this stunning test ride! Frequently, the XC70 is bought just for its appearance. The car is a little higher on its legs than the ordinary V70 and is equipped with all-over protective reinforcement. Chrome edges around the wide-beam headlights, along the doors and under the bumpers highlighting the rough character of this third generation of Volvo's cross-country . However, it's not only about the outward appearance. The protection underneath the car is as important for ensuring that the car remains intact during a little bit of off-roading. The interior of the XC70 is comparable to that of the V70, with an identical kit. This tougher sibling is neither finished in dust-resistant fabrics, nor does it have any extra hand grips. There isn't even a compass. The interior of the XC70 is suffused with an air of luxurious and comfort, packed in a cloak of sophisticated Swedish design. The dashboard is taut, modern and extremely well-organized. The finish is more than perfect, the space ample and technology modern. Moreover, the complete car has been well thought through. Everything works as it should; the newest gadgets can be used straightaway without having to consult the instruction manual. In short: the XC70 gives the driver a good vibe from the first moment. This is also recognizable in the well-considered manner of how the luggage space can be utilized. The lid of the boot can be opened and closed electronically, as well as with a remote control. The floor of the luggage space is on rails, making loading and unloading easier. The whole luggage space can be equipped with leashes, nets and eyelets as desired. To further increase the luggage space, the back seat can be folded up at a flick of the wrist. It is fairly evident that Volvo has been building estates for more than 50 years. Another point of expertise for Volvo is security. Collision Warning alerts the driver if the speed difference between itself and the car in front is too small. The same sensor is used to automatically maintain distance when cruise-control is being used. With a warning light, the BLIS (BLind spot Information System) makes you aware of other cars entering into the blind spot of your side mirrors. On the rear seat, the child seats are integrated into the main seats with side airbags running downwards to protect the children. A crossbeam has been placed low under the front bumper which prevents the XC70 from driving over a lower car in the case of a possible collision. The new XC70 is available with either a petrol or a diesel engine. In both cases, it is the strongest engine which the V70 is available as. The 3.2 litre six cylinder petrol engine also delivers massive performances in the XC70. The D5 diesel engine, which was test driven, is by far the most advantageous of the two. This is irrespective of the annual mileage of a diesel always being cheaper than that of a petrol version. However, the difference in performances is enormous. The XC70 D5 is more than quick enough to keep up with the rest of the traffic. Even on the German Autobahn, the performances of the diesel engine are praiseworthy. The overwhelming dominance from the petrol engine failed to materialize on this occasion. Up to this point, the XC70 has been no more than just a tougher version of the V70. But the XC70 does offer a lot more. As has been indicated earlier, the XC70 is higher on its wheels, which gives it extra ground clearance. This is immediately evident when driving. The XC70 reacts fractionally less acutely than the V70. Also it has a habit of inclining a little bit more into turns when they are taken quickly. This difference is marginal and the XC70 drives a lot better (and safer) than the average SUV. Even so the off-road capacities are barely surpassed by those of the average luxury terrain vehicle. 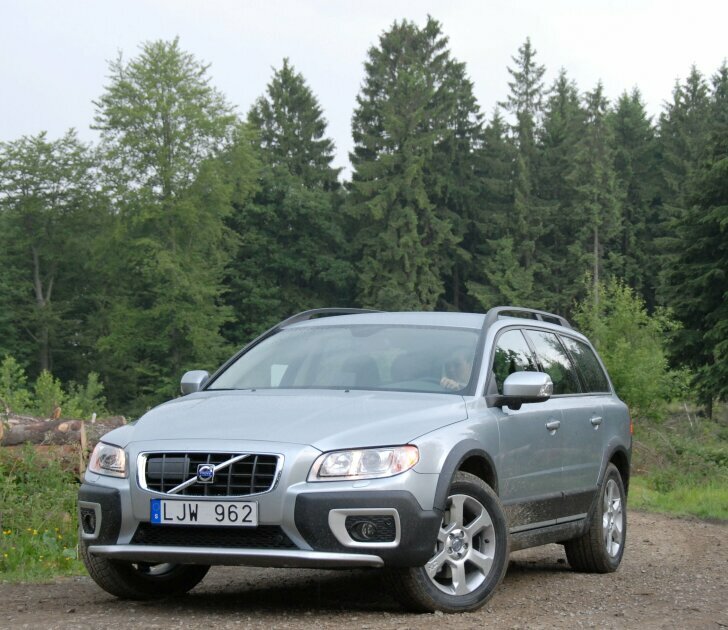 The movement of the XC70 is in general fairly similar to that of Volvo's own SUV: the XC90. Under normal circumstances, the engine power is transmitted only into the front wheels. Only when it is necessary, is the traction automatically distributed over the front and rear wheels. The advantage of this is that fuel consumption remains low. The disadvantage is that on the odd occasion the electronics kick in too late. With a car like this, the advantages do outweigh that one disadvantage. 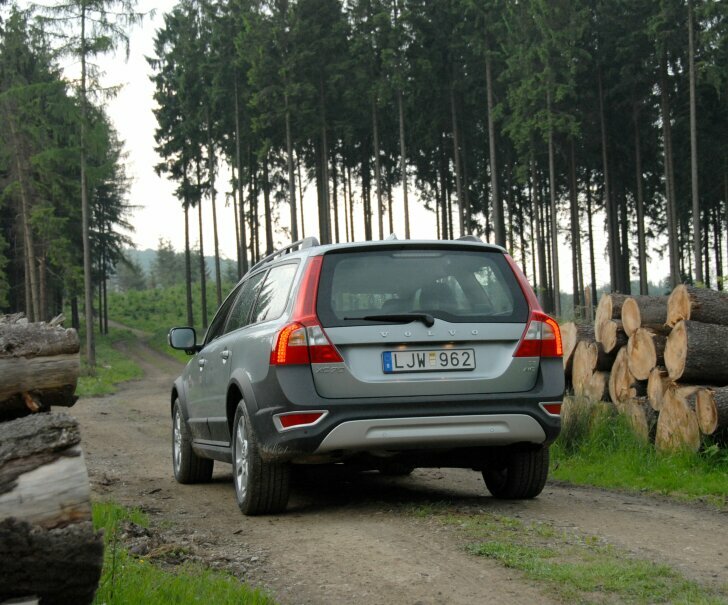 Even more to the point: the XC70 really knows how to win the off-road argument. Whereas the petrol engine is an indulgence with its sprint strength, the diesel engine performs off-road with a lot of pulling power. The strength of the diesel engine is easy to apply in small doses, which can either prevent the engine from cutting out (too little power) or from flooding itself or even burying the whole car in mud (too much power). Steep slopes are absolutely no problem. The optional Geartronic automatic keeps the car between slip and grip in an exemplary fashion. Hill Descent Control is designed to make descents easy: the electronics restrict the maximum speed to 10 km/hr, allowing the driver to focus their entire attention on the terrain. p>Even with standard tyres, the XC70 is not afraid of a little mud, clay or even the occasional ford of water (wading depth: 300 mm). When it's necessary, the four-wheel drive automatically redistributes the power over the front and rear wheels. The difference with a real off-road vehicle is the restricted ground clearance (210 mm), the considerable size of the car and the prominent overhang in the front and the rear (front angle: 19.2 degrees, rear angle: 24 degrees). The XC70 is not designed to cross a desert or even to conquer the jungle. However, the off-road capacities of this chic estate don't restrict themselves to a forest path or a cart track; the XC70 can take on some serious off-roading! It's not necessary, but it's very nice that it can! Volvo has introduced the new V70 and XC70 simultaneously. The space, security, luxury and comfort of both cars are exactly the same. The XC70 offers more luggage space, well-considered and innovative security systems, as well as all the luxury, which can be expected from this class. As the XC70 is higher, it steers and thus reacts less accurately than the V70. All the same, the XC70 does drives considerably better (read: safer and more economically) than larger, higher SUVs. The off-road capacities are not bettered by any of those more luxurious lifestyle off-road vehicles. Not everyone will want one of these; yet for many its tough appearance will be its greatest attraction. 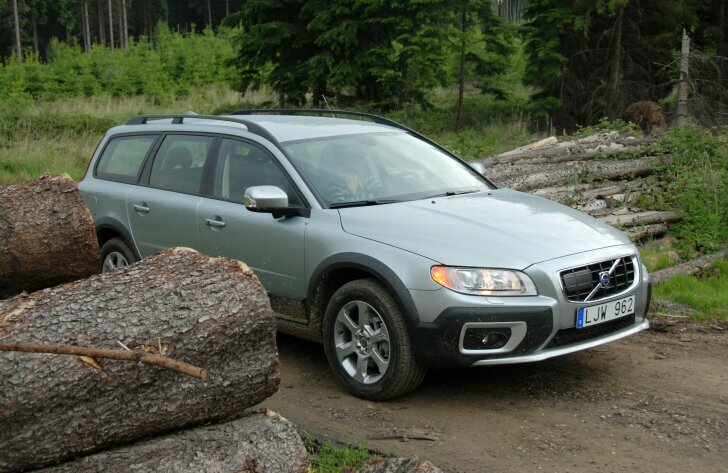 For the Volvo XC70 the following holds true: it's a can-do but it's also a can-chill car. "Where there is a will, there is an AllRoad"